You’re halfway through the year and that calls for a well-deserved break. But winter means all you want to do is snuggle in bed. But, what if we told you that you can have a winter escape that’s cosy and requires #nofilter? The answer is secret cute cabins. Not only do they make you feel as if you’re in a movie, but also provide picture-perfect panoramic views. Treat yourself to a perfect weekend away from your hectic lifestyle. Throw away the clock and spend some quality time on yourself at Warm Earth Cottage. The name says it all—it’s all about the cosiness and warmth here. The wood-burning stove will keep you snuggled, providing all the necessary warmth required. A cute breakfast hamper will be at your door in the morning for you to cook your delicious brekkie. While you’re there, make sure to have a bath in a tub right under the stars, #magical. Located in the South Island, on a deer breeding farm, Hapuku Lodge & Tree Houses are not to be missed. Staying there is one of those fairy tale moments where you’ll have to pinch yourself to check if you’re awake. This is luxury accommodation right on Kaikoura’s coastline. Remember when you wanted to build a treehouse in your backyard? Well, now you don’t have to, instead have a weekend escape here instead. If you’re feeling adventurous, head to The Camphouse. The backdrop of the mountain makes you feel as if you’ve walked straight into a painting. Here, you can climb to the summit of Mt Taranaki and even walk the Pouakai Circuit. Afterwards, head down to the Kamahi Cafe for some well-deserved brunch. Sounds like our kinds of holiday. 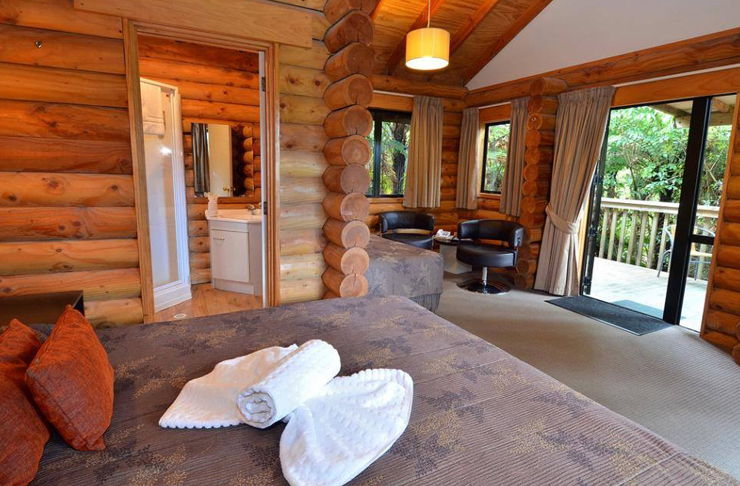 If you’re looking for a more luxury getaway head to Wainui Country Retreat. A private waterfall and an outdoor bath—what more could you need? This holiday cottage is on a 45-acre farm stay a.k.a the ultimate escape. This is the perfect location to capture the views and the vibes. You can even cook your own pizza on the wood-fired pizza oven. What are we still doing here? Let’s go. Get active and relax at the same time at Woodbank Park Cottages. All you need is your favourite wine and an attitude for adventure. 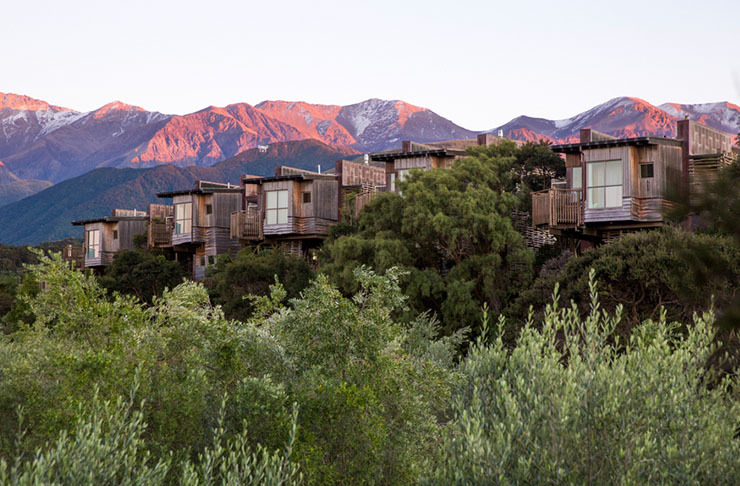 Some units include a balcony with mountain views—you’ll never want to leave. The cottages even have a garden, bbq and sun terrace, so much room for activities. You can even head out for golf and hiking while you’re there too. This time you have no excuse—your only job is to have fun. Both a treat and a retreat, Te Kouma Harbour Cottages provides a tranquil setting, making it the ideal location to relax and get away from any of your stress or worries. Overlooking the Te Kouma Harbour, you'' be guaranteed of breath-taking views of the sunrise and sunset. There's also a free pool and kayaks that you should definitely take advantage of! Being surrounded by beautiful farmland, you even get to see cute little ducks and peacocks going about their day to elevate your country style getaway. Turoa Yurt Village is the definition of living outside the square. Inspired by the traditional Yurt design, artist Bret Gibson designed this unique ski village in Ohakune. The Yurt chalet has an open living area with a dome ceiling, with windows facing Mt Ruapehu. You can expect snow covering your roof with a scenic backdrop of snow covered mountains. If you’re looking for a place to have your next business conference or family event then this is the place. Tidal Waters Log Lodge is New Zealand’s largest log houses set on 24 acres, overlooking a stunning beach. Sounds like it’s time for a photoshoot! You can even take your pets along too, giving them a well-deserved break and chance to be #instafamous. Make the most of your time there by indulging in wine tasting, cycling and surfing. Furthermore, the lodge is solar powered and supported by a generator! This is the ultimate destination to get away from city life and experience life off the map. Cob Quarters is based on the banks of Waihopai River with views to the marvellous mountains. The cottage offers history, beauty and mysterious charm. It’s beautiful inside and out—with views to the mountains and views across the station you’ll be taken to a different world. You can also take your bathing to the next level, with an outdoor shower that overlooks the river. Complete bliss. Logs, logs and more logs! Tree Huts are log cabins in the rainforest, each with its own private deck. It’s like something out of a movie! Activities such as lagoon kayaking, walking on glaciers and skydiving are all close by. This is the place you’ll make memories you’ll never forget. Discover New Zealand’s hidden treasures and have the time of your life while you’re at it. The opportunities are endless. If you’re looking for panoramic and native views, Birds Eye View Lodge is the place for you. What’s even cuter is that you get to climb a ladder to the loft for your beauty sleep. From your room, you can see wallabies and deer running around in their natural habitat. If you’re feeling brave, you can even try to get a selfie with them. There’s also plenty of room for mountain biking and horse treks (just remember to bring your own bikes and horses). The Gypsy Cabin provides you with an opportunity to get away from your luxurious lifestyle. Why not experience life on a more miniature scale instead? 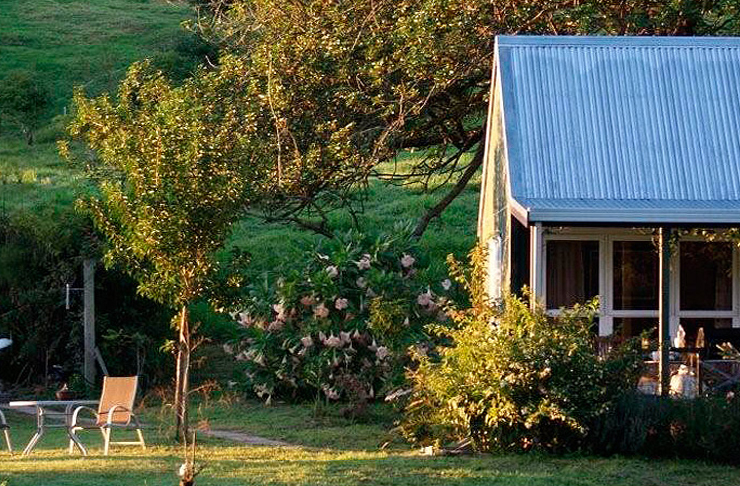 This is one of the smallest and cutest cabins we’ve seen. Perfect if you want some alone time or take your best mate with you. What’s more—this is your chance to become besties with others in the cabins next to you.